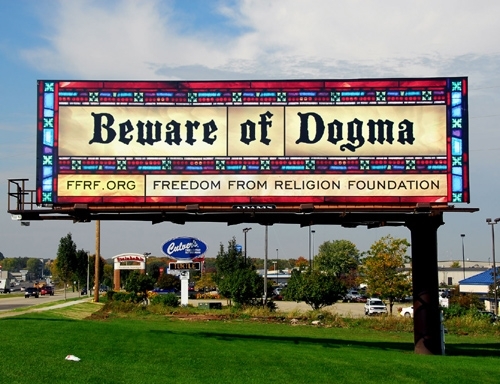 Beware of DOGma…and its owners! I’ve always grappled with this idea of not really “feeling” religion like that (simply meaning that religion didn’t resonate with me), yet calling myself “spiritual.” I would listen to people’s interpretations of spirituality, and listen to religious people tell me that I can’t be spiritual without having God in my life, which meant reading my Bible, engaging in fellowship with other “believers,” which would, perhaps, have to take place in a church. I just wasn’t feeling it. And I had difficulty explaining why I wasn’t feeling it because religious factions had done such a phenomenal job of dissuading me from any religious involvement whatsoever, so much so that I didn’t even have much interest in reading much of the biblical scripture to gain my own personal understanding of spiritual truth.